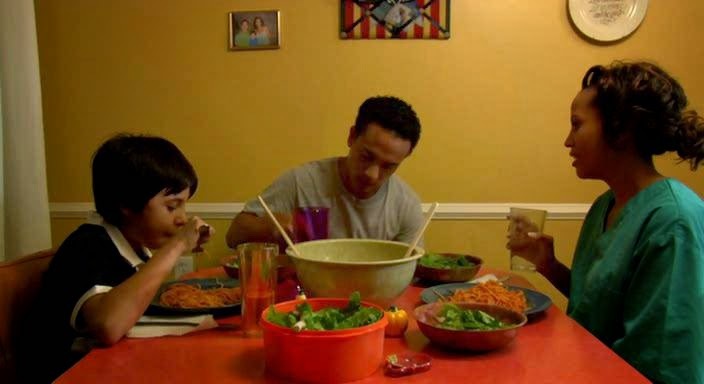 Last week, we examined what happens when Christians make a movie for Christians. This week, we examine when Christians make a movie for teen Christians and try to be cool about it. Long ago, roughly 7 years, a group of middle aged white men, got together in a house, probably somewhere far far away from Hollywood, rolled up their short sleeve button down shirts and mused, "What do kids like these days?" And one of them said, "My daughter likes that Zac Efron punk. Also musicals. With teenagers." And with a snap of the fingers, Sunday School Musical became an official thing and this week's Netflix find. "Look, if you just tell teenagers that you can't have "worship" without being "hip" they won't know. So write it a bunch of times." Hey kids - here's cool kids being cool! If you've seen High School Musical, its kids in high school and they're singing, but there's some conflict and color coordinated track suits. Also Zac Efron is worried that people will judge his manliness for wanting to skip around a stage with the girls. That's not what happens here. There's a choir from a "urban" neighborhood and a choir from a "better" neighborhood. One is by the book and terrible, and the other is really in touch with their funky hip hop selves. Given that this is a movie called Sunday School Musical, start putting your bets on them uniting. Because it will pay off. "Teenagers like it when you come together. Its in that song from that movie your daughter likes." Not to mention this is a regional choir competition, that only had two choirs competing. These actors just realized that their careers have come to a screeching halt. These kids however...well, they're on to something. We have our hero, who's name I didn't catch and his choir mate, passing rhymes and catching beats in the squeakiest cleanest way possible. They're bonded by their love of choir. Nothing will tear that apart. "Kids, we're being kicked out of our house and moving to a much nicer neighborhood where you'll be going somewhere with a lesser choir. Deal with it." Despite the fact that the competing choir is at a high school, eliminating the meaning of it being a Sunday School Musical, the adults apparently have no interest in it. Which is why they have a high school girl named Savannah in charge of their music program. 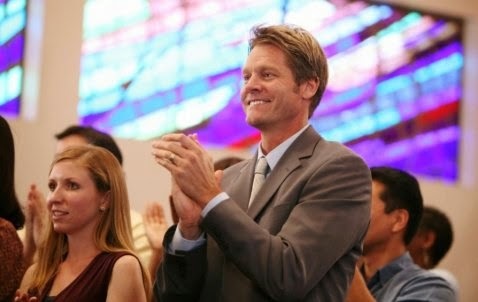 Please note that Savannah's father has the classic Youth Pastor look. The button down shirt says he's ready to buckle down and worship, but the frosted hair says, he's down to jive with God's awesome word. What happens when you let the "urban" kid into your choir rehearsal? Its going to be a boogie breakdown. He brings in his Justin Timberlakeyness and blows everyone's minds. Not every member is onboard with these flashy rock and roll ways. Like this guy. Who also compares the only "urban" kid in school to Judas. It happened. Because the filmmakers are "hip". Like this character's mic pack sticking out of her jeans. 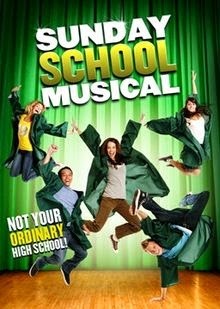 High School Musical wasn't the only thing that got ripped off. A Grease moment totally happened here in this high school that only has 8 students in their roster. I'm concerned about these high schoolers, who have been lying to us this whole time and have been held back and are actually attending an ELEMENTARY SCHOOL. The school has repressed his inner rhythm and therefore he goes to the bathroom to do the robot and whatever dance moves the kids do these days. Not that I know - the filmmakers would, so ask them. Apparently, they're really "hip." Choirs unite! We've been waiting for this moment. Thankfully, its awkward and uncoordinated, complete with bad lip synching. Its time for the big "States" competition. Do we know which states? Why not national? And the united choir brought their game AND their blue shirts of varying hues. 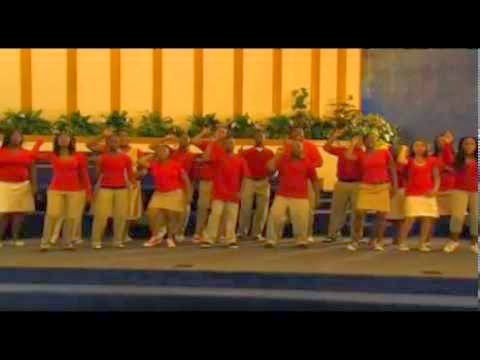 Not like the competing choir from a more "urban" area, showing off their red. Super cool Youth Pastor Dad gives his seal of approval. They totally rocked this Sunday School. At that point, the makers of Sunday School Musical patted themselves on the backs and knew, they had reached a generation and they're teenage children would finally accept them as one of their own. Stay tuned for when these intrepid filmmakers realize that teenagers like vampires and release Sunday School Twilight. It is going to be so fetch.